How does a face open a door? The ethical debate about identity cards has been reignited following the Queen's Speech, but its facial recognition technology is being used in other areas. Police are hailing it as a forensic breakthrough and a new "foolproof" 3D version could eventually become a routine procedure at cash machines or workplaces. Once the preserve of science fiction, biometric facial recognition has now become a reality. Despite its association with the controversy of identity cards, it is predicted to become part of everyday life. A few corporations are already scanning pictures of staff for access control or to tackle swipe card fraud. And six police forces have so far recognised its use in identifying CCTV pictures of suspects - one claims it to be the biggest forensic breakthrough since DNA. As companies become more security conscious, the process of having our faces scanned is set to become more commonplace. And new technology which can produce this in a more accurate 3D form could accelerate this trend. A firm which has developed the 3D software, Aurora, claims it is sophisticated enough to distinguish between identical twins. I underwent the procedure myself and it only took a few seconds. A camera used a near-infrared light to put a virtual mesh on my face 16 times. It merged these into one unique template and calculated all the measurements of my features. These could theoretically then be instantly checked against a database to control access to a building or allow a cash machine withdrawal. Existing biometric face tests, which are two-dimensional, are affected by changes in lighting and facial expressions. And critics say they are susceptible to fraud. The government's biometric trials for passports and identity cards have reportedly experienced a 10% error rate in face recognition. The Home Office denies this and says that in any case its trials were only testing the procedures and the public response, not the technology. Aurora claims its software eliminates these alleged errors. Founder Hugh Carr-Archer says: "We can't say it's 100% but we've done tests and have a zero failure rate. "Providing a secure environment is paramount to protecting assets, profits, people and brand reputation. 3D recognition is a huge leap forward for access control." He claims a major UK airport is interested in introducing it to check the right passengers board the plane. And in the future it could replace a PIN for withdrawing cash at the bank. Another idea mooted is for members of a night club or casino to get instant access without queuing up. Liberty - the civil liberties group strongly critical of identity cards - has no issue with these kind of methods. Spokesman Barry Hugill says: "Our position on biometrics is neutral. It's another form of identifying and it's no different from traditional photography or fingerprints." It may be a long time before the police can afford to embrace the 3D technology but they claim to be getting plenty of success with its predecessor. It works by scanning an image of a suspect's face - such as a CCTV picture taken from a crime scene or a drawing based on eye-witness accounts. 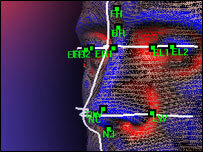 This produces a 2D map of the face which marks attributes such as the distance between the eyes. 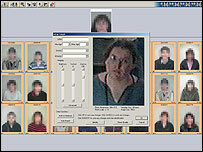 Then the computer uses an algorithm to compare the data of this face to thousands of others on a database of offenders - people who have ever been arrested or charged. Within seconds it lists the matches in order of relevance, just like a web search engine. A match is not sufficient to convict in court - it is not even admissible as evidence - but it directs the police to possible suspects. West Yorkshire Police were the first to use this method and claim that since its inception in June it has led to the arrest of suspected rapists, robbers, drug dealers and others. It says 70% of images searched have produced useful intelligence worth researching further, with two or three arrests a week as a result. Det Supt Mick Fickling, head of scientific support, says: "The use of images is rapidly becoming the third forensic science alongside fingerprints and DNA. "Prior to the creation of this system, CCTV images of suspects could only be circulated within the force or publicised in the media or on posters, to try to identify them. Now we are able to narrow down likely suspects in a very short space of time." The search can be narrowed by area to those living within two miles of a burgled warehouse. Although this technology is slowly capturing the imagination of the police, it has yet to invade the consciousness of the public. But it may only be a matter of time before we have our faces mapped in our daily lives.